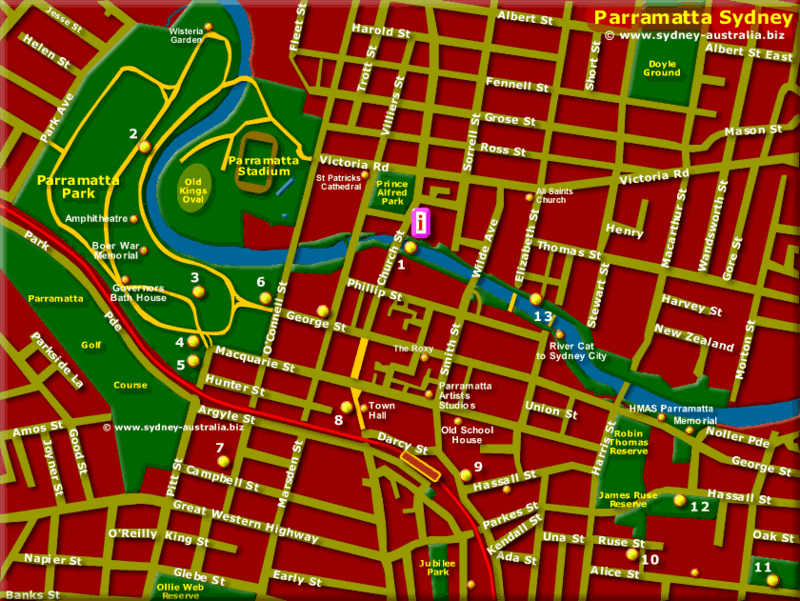 For more on Parramatta in Sydney West, see Parramatta Sydney NSW. Parramatta Sydney, played an important part in the history of Australia. When the soil nearer the original settlement of Sydney Cove proved inadequate for the growing of crops, Governor Phillip began Parramatta as a farming settlement only seven months after the arrival of the First Fleet. See more about the early History of Australia. A good place to start would be the Parramatta Heritage and Visitor Centre, found on Church Street by Lennox Bridge and overlooking the river. Phone +061 2 8839 3311. Al fresco Parramatta restaurants can be found on Church Street, between Phillip and George Streets, while you can find many more on the streets leading to there. Some great shopping can be found at Parramatta Westfields, near the train station (center of map) as well as the surrounding streets, from fashion, clothes and accessories to bargains. Take the Riverside walk (#13 on the Map) to explore this area and taking in the history from an Aboriginal perspective. Old Government House, located in Parramatta Park at (#3) houses the finest collection of colonial furniture found in the country as well as being in the oldest surviving government building. See more about Western Sydney attractions and places of interest: Western Sydney Attractions. Map shows major roads, arteries, shopping and location of Penrith Attractions, including Muru Mittagar Aboriginal Cultural Centre, the Joan Sutherland Performing Arts Centre, the International Regatta Centre and Penrith Westfield Shopping Centre. Map of Penrith. Mamre Homestead, on Mamre Road is located just to the east of the map. For a good hands on experience, visit the Arms of Australia Inn Museum, open on Wednesday and Thursday 10am to 2pm and Sundays 1pm to 5pm. To see more information on the many attractions in the Sydney CBD Center. Sydney and NSW accommodation includes hotels, motels, luxury resorts, caravan parks, campsites, bed and breakfasts, backpackers, serviced apartments and beachside holiday homes.